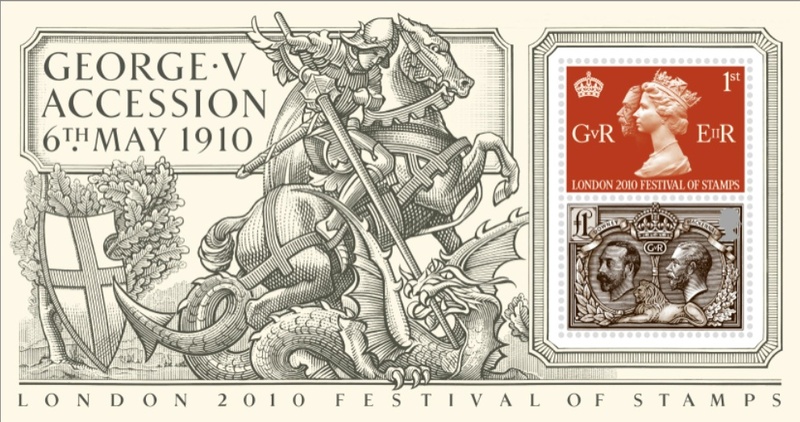 Royal Mail has announced a number of stamp issues in connection with the London 2010 Festival of Stamps. - a 1st class orange bearing the Machin head of Queen Elizabeth II and the profile head of George V as used on stamps from 1912. - the second stamp is a £1 in brown showing both Downey and profile heads used on British stamps of his reign. 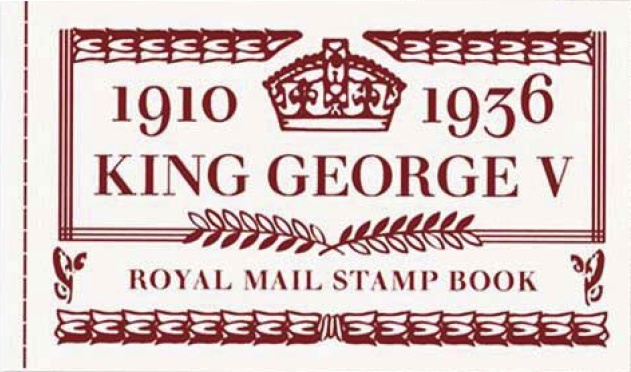 To the left of the stamps is the design of St George slaying the dragon, from the 1929 Postal Union Congress £1 stamp. As far as we know the sheet will be sold for face value - £1.42. It is printed by Cartor Security Print in litho. The second miniature sheet will be issued on Saturday 8 May, the opening day of the London 2010 Exhibition at the Business Design Centre in Islington. This sheet has four stamps depicting stamps from the reign of King George V.
2 x £1 depict the 10/- blue and £1 green Seahorse definitives. The sheet is printed by Joh Enschede in lithography and intaglio. This will contain one pane containing the two Seahorse stamps, one pane of 4 Empire Exhibition stamps, and one or more panes of Machin definitives, details in due course. The book is produced by Cartor, with intaglio panes printed by Enschede. 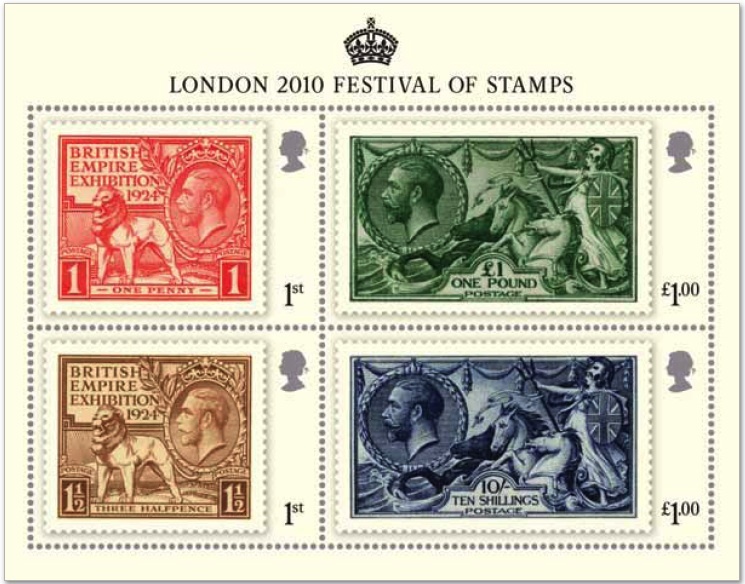 A third stamp issue will appear during the London 2010 Festival on 13 May, consisting of a set of 8, a miniature sheet and a further prestige stamp book. 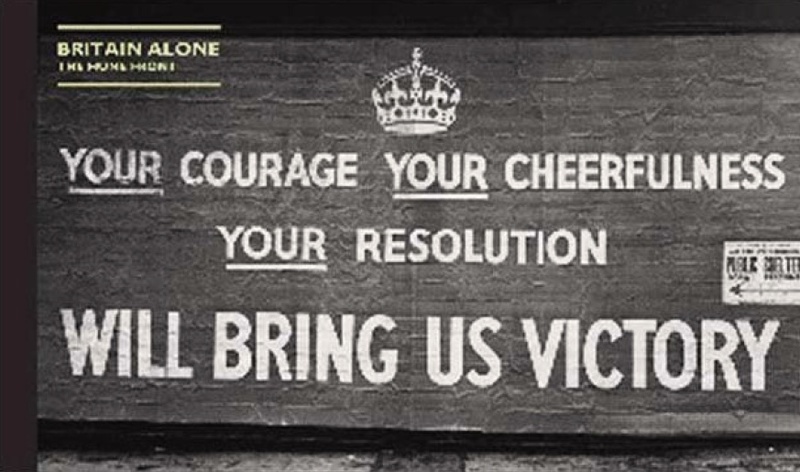 Entitled 'Britain Alone' the issue recalls the dark days of World War 2 including the evacuation of British forces from France at Dunkirk followed by the Battle of Britain. Indeed 'Britain Alone' is the title of at least two books on the period. 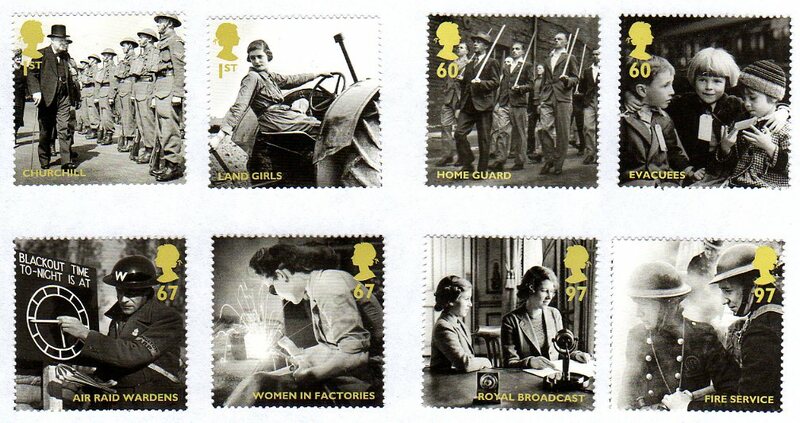 90p Royal Broadcast by the Princesses Elizabeth and Margaret; Fire Service. 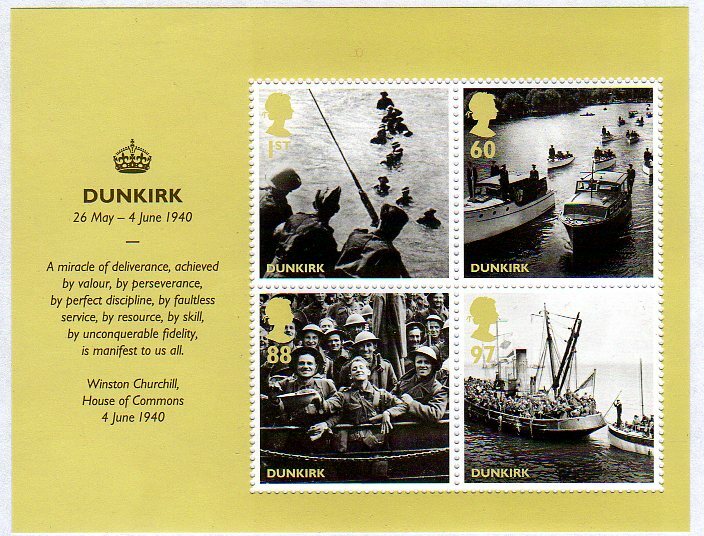 The miniature sheet recalls the Evacuation from Dunkirk, including a quotation from Winston Churchill, with 1st class, 56p, 81p & 90p stamps showing the evacuation by the flotilla of little ships. The Prestige book will contain the Dunkirk miniature sheet, two panes each with 4 Britain Alone stamps, and a pane of mixed Machin definitives, details to be announced. The set, miniature sheet and PSB will all be printed by Cartor in litho.